Rent the Apple iPad 2 today and use it right now short-term in the USA or for international travel around the world. We were the first US rental company to add the Apple iPad 2 rental to our original Apple iPads, the ones we have been renting daily since April 2010. Short term rental is a great way to move forward with the overwhelming numbers of different tablets coming this year on different carriers. "Add to basket" and start a rental now! The iPad is the most popular and inexpensive internet access tablet to rent from InTouch USA. Now with the Apple iPad 2, front and rear cameras, FaceTime, HD Video, thinner, lighter and faster make iPad 2 the tablet to rent right now. Capture attention and bring the buzz to your ideas, apps and products tomorrow (if you call 1-703-620-0879 to arrange immediate overnight delivery). If you would like to try the Apple iPad before you buy, be sure to consider our iPad or iPad2 rentals starting at just $99. If you are interested in experiencing the iPad for yourself or have a trip overseas and need a cost effective way to access the web and stay on top of your emails, this is the rental opportunity for you. Many companies looking for ways to increase productivity have already started evaluating the iPad2 as a potential laptop alternative and are renting iPads to see how they could use this technology. This short-term trial has no long-term contract so you don't have to deal with the potential headaches. We offer the best rental solution and lowest price to evaluate and use tablets with different wireless services and applications. Let InTouch USA help you do a hands on comparison of the Apple iPad 2 vs. the Galaxy TAB Motorola Zoom HP Touch Pad RIM PlayBook HTC Flyer LG Optimus Pad Dell Streak and other available tablets. Short-term rental requires no purchase order or 24 month contract. Renting one today is perfect for developers, corporate evaluations, overseas trips, trade shows, product reviews of GSM vs. CDMA and for special events. Rent the device with active data services, understand iPad functions, apps, features, how the iPad works in your world and on the wireless carrier in your city (without any term obligation). Just experience it by turning it on, use it as long as you like and return it back to us in the enclosed mailer to complete your rental. Companies can demonstrate their apps or evaluate other Apple App Store products on our rental iPhone 3gs, iPhone 4, iPad or iPad 2 using wireless connections from Verizon, AT&T and T-Mobile in the USA. Apple iPads make a powerful trade show demonstrations and you can show your applications working on any or all 3 major providers without needing to own any or all three wireless service contracts. Why contract for more expensive or long-term wireless service when you really only need to use the devices and wireless service for a week or maybe a month? 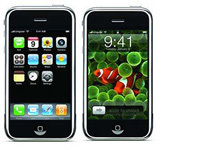 Rent an iPhone 4 from us at the same time you rent the iPad and use the Personal Hotspot feature of our Verizon iPhone 4 rentals using CDMA or iPhone 4 rentals using GSM. GSM 3G cellular data "MiFi connections" require iPhone 4 with iOS 4.3. We suggest you rent the iPhone 4 CDMA MiFi for larger busy trade shows if a number of the shows attendees are going to be using wireless GSM data. With our CDMA MiFi iPhone 4 rental, you might experience a faster data response if the Verizon network is less congested. Rent your own private WiFi connections in your trade show booth or other location for up to 5 users with Verizon iPhone 4 using CDMA or up to 3 users with GSM carrier versions of iPhone 4. Bluetooth and USB connections are also available and all connections are password protected. Now you can use any WiFi device on the temporary hotspot "you create" using our rental iPhone 4. Share the internet access with other iPads, computers and devices in your meeting rooms or booth area. Overseas iPad 2 or iPhone 4 rentals are also available with prepaid international SIM cards and post data usage. Overseas wireless internet access using WiFi and 3G are possible when you rent an iPad or iPhone. We rent special "never locked iPhones" for use with 150+ overseas carriers using special prepaid Micro SIM cards. For the diplomatic community, we have iPads and iPhones that work with their carriers Micro SIM cards. We rent USA SIM cards with data plans for iPhone and iPad for short term delegations visiting the USA. We also feature InTouch USA's iSIP VoIP internet calling (inbound and outbound) for the iPad, iPhone and iTouch to make low cost international wireless calls from overseas. We accept your personal or business credit card for all equipment rental costs, airtime and data usage, security deposit and shipping via FedEx. You are good to go with either the iPad 1 rental or the iPad 2 rental unit(s) that you have been wanting to experience. No service contract or equipment purchase required so eliminate long drawn out approval time from other departments. Now that you realize your company needs to experience "Now", "First Hand" what the iPad can offer business professionals, it is time to fill out the rental form by clicking on the "add to basket" and move your ideas and projects forward today. $25 for 250MB minimum data usage required per week for 3G version. Additional 250mb blocks billed at $25 per block. Your iPad2 will arrive all set up and ready to use via Overnight (or 2 Day) FedEx. Please be sure to order as far in advance as possible as these rentals have been extremely popular. Orders to be shipped the same day must be received by 10am EST unless other arrangements have been made. Your mobile number for short-term usage is already assigned: all you have to do is experience it, enjoy it and return it. This is your chance to compare it to the original iPad and find out what all the buzz is about. Let us spend the time and expense of doing the set up, registration and subscriptions. You can just concentrate on using the iPad2 and experience for yourself how it performs in your daily work life, geographic area and company setting, before signing up for a two year commitment or dealing with the potential hazards of purchasing an iPad or iPhone. Only InTouch USA will allow you to decide if it's time to buy. By renting the iPad2 from InTouch USA, Customer agrees that they are responsible for all malfunctions, failures, damage to or loss of the iPad, except those due to manufacturing defects and normal wear and tear. In the event of damage or loss to the rental iPad2 for which Customer is responsible, Customer will promptly notify InTouch USA and either pay (i) an amount equal to the Equipment Replacement Value, or (ii) the cost of repairing the iPad, if InTouch USA or Apple determines that the iPad 2 is repairable. InTouch USA determines that iPad 2 is not repairable, then option (i) above will apply. Customer agrees to pay the published rates for the use of the services and acknowledges receipt of a copy of said rates. Customer agrees to abide by the acceptable and published rules concerning use of the Apple iPad. Customer understands InTouch USA has no control over quality of coverage and network conditions. It is further understood that not all iPad2 features can be used in all areas. Customer must return the iPad2 in the exact same condition in which it was received including removing all personal data (including all pictures, music, videos and contacts). If any music or video content is added to the iPad2 customer agrees to use iTunes versions below 7.4. If any personal information is left on the iPad, a minimum $50 cleaning fee will apply. Customer understands that all of the information, material and software on the iPad 2 is the property of InTouch USA. Customer agrees not to perform any over the air firmware updates or load any third party software without first obtaining expressed written permission from InTouch USA. Rental Charges and Security Deposit/Reserve: Customer will prepay InTouch USA $99 for 7 days (�Rental Charges�) and pay the prepaid data fee for any domestic data usage. International data useage billed separately. In addition, a reserve against the Customer�s credit card equal to the equipment replacement value of $600, plus applicable taxes (�Equipment Replacement Value�) will be charged to the customer's credit card before the customer receives the device. This reserve will be maintained by InTouch USA and will be applied against any damage to or loss of the device or other payments due. If the iPad 2 is not received by InTouch USA by the end of the Rental Period, Customer�s credit card will be charged with the full Equipment Replacement Value, but if Customer later returns the iPad 2 and it is received within seven (7) days after the end of the Rental Period, InTouch USA will retain $99 per week as additional rental, plus applicable minimum usage requirements, taxes and the cost of repair for any damage for which Customer is responsible, and the remainder of the Equipment Replacement Value will be credited to Customer�s credit card. In no event will the Customer be entitled to a refund if the iPad 2 is returned to InTouch USA before the end of the Rental Period.